As soon as I walked in, the first visible colors were a light green and a shade of red-orange, reminiscent of vibrant red and green curries. After waiting for a few minutes, my family and I were brought to another part of the restaurant where it was a little darker, which adds to the exciting mood of the restaurant (but is unfortunately not so good for pictures). 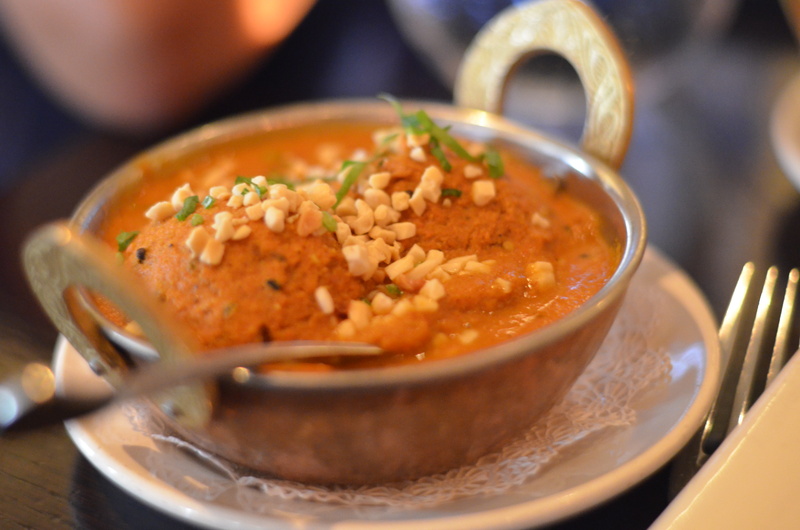 Rasika offers a ton of choices on their menu, and there’s something for everyone whether you’re not a fan of spicy food, someone who doesn’t eat meat, or someone who has never had a bite of Indian food in their life. 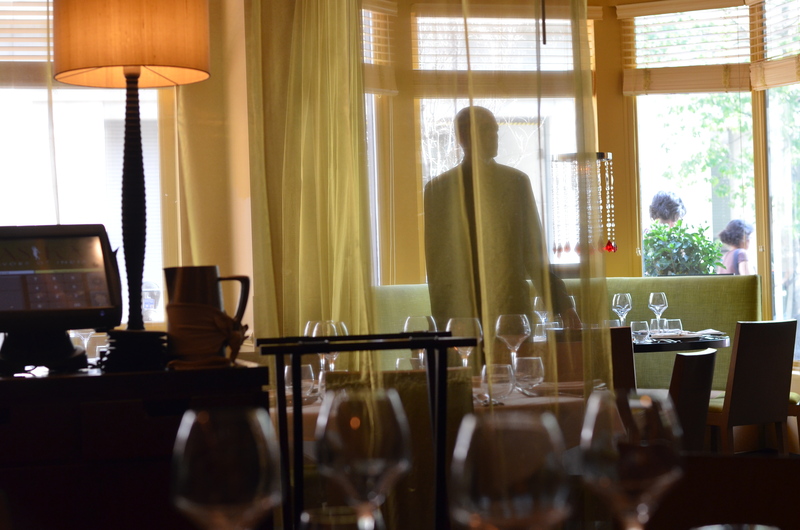 I realized very quickly that the most attractive option for me was the tasting menu. 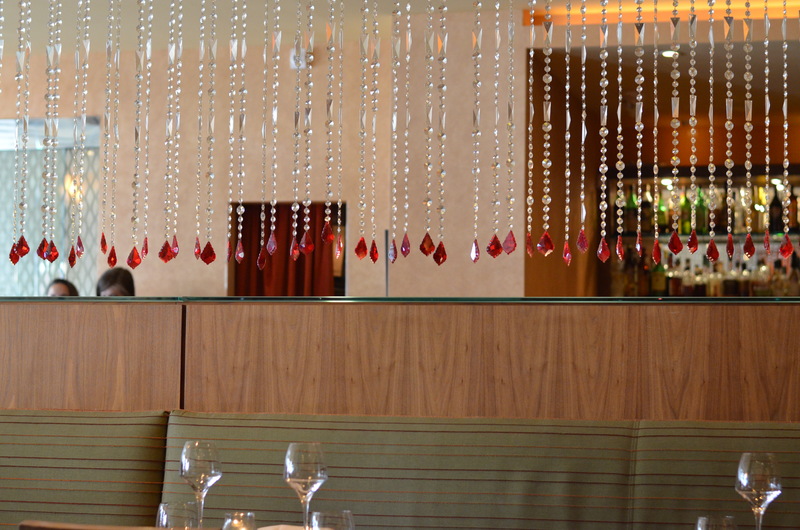 The restaurant offers a few different tasting menu choices—there is a four-course and a seven-course choices with an option for either vegetarian or regular. With the four-course tasting menu, the vegetarian option differs from the normal one in that the second and third courses are significantly different. It’s not a simple substitution of, say, chicken for tofu or fish for eggplant. The dish itself is different. 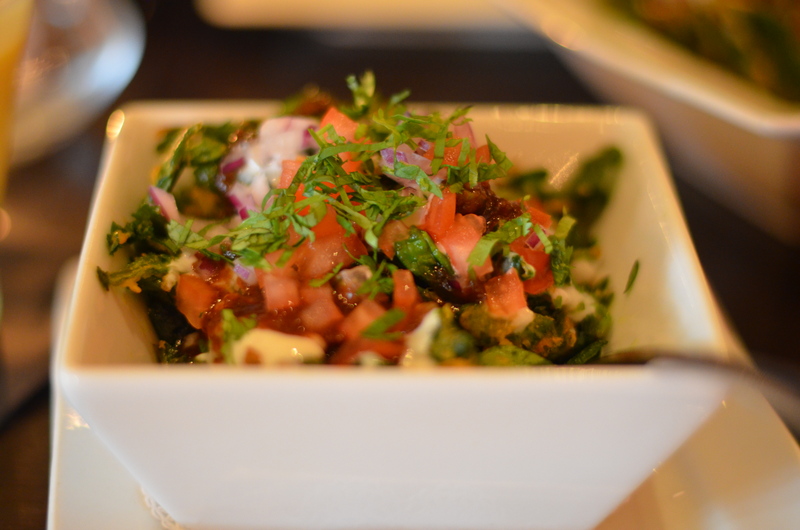 The first course was a palak chaat, a delicious “salad” made of crispy baby spinach, sweet yogurt, tamarind, and a date chutney. The palak chaat was easily the very best dish of the entire menu, NOT because the other courses weren’t very good but because the palak chaat was just incredibly amazing. 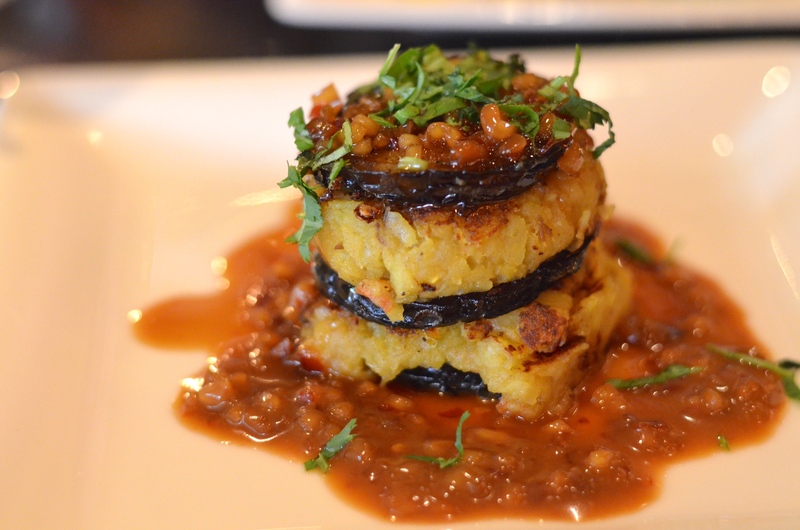 The second course was a tawa baingan, a tower of eggplant and spiced potatoes topped with olive oil, peanut sauce, and tamarind. 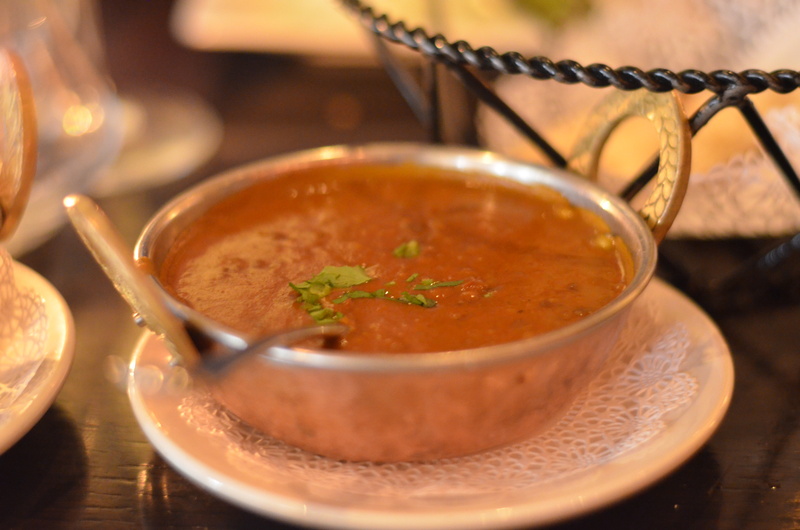 The third course, the main entrée, consisted of about four bowls of different food, served with basmati rice and naan bread as well as bhindi amchoor, a sliced okra with dry mango powder. In the first bowl was a very delicious eggplant purée. The second bowl was a spicy potato “dumpling.” The third bowl consisted of sliced cottage cheese in a tomato-based sauce that also included onions and bell pepper. The final bowl was a a lentil soup seasoned with tomato and fenugreek. My favorite of the four was probably the eggplant purée as it packed the most flavor. The others were good, but not necessarily mind-blowing. 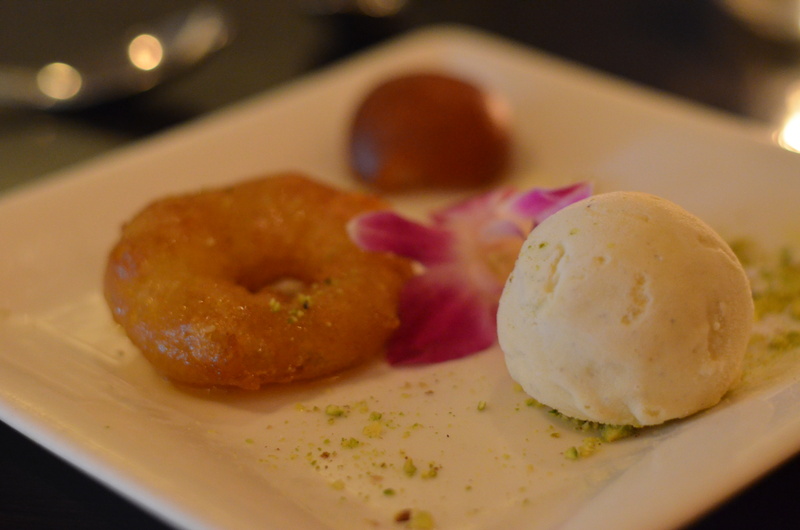 The fourth and final course, dessert, was a plate of three different desserts: apple jalebi, gulab jamun, and cardamom ice cream. Dessert was the weakest part of the menu since the apple jalebi and gulab jamun weren’t particularly memorable or all that exciting. The cardamom ice cream was interesting just because it appeared to be sweet like vanilla but actually turned out to be savory because of the cardamom flavor. 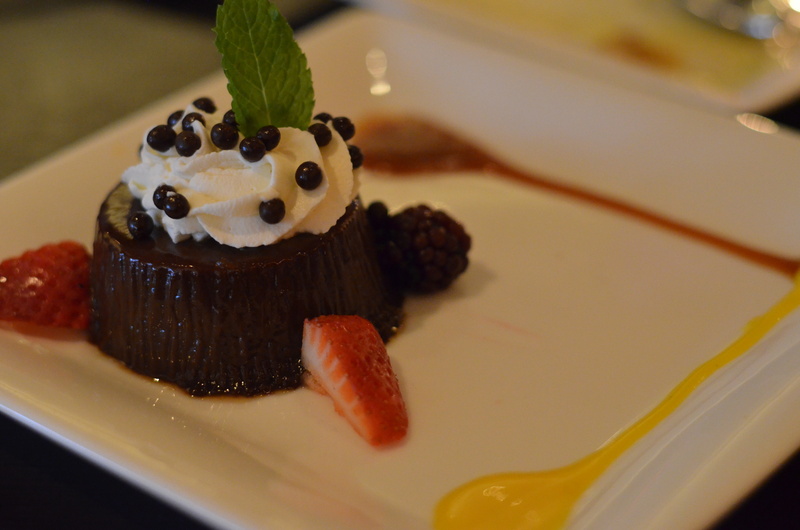 Just as I was finishing the fourth course and feeling completely and utterly stuffed, the server brought out a special birthday surprise: a small, chocolate dish made with coffee and adorned with caramel and saffron sauces. 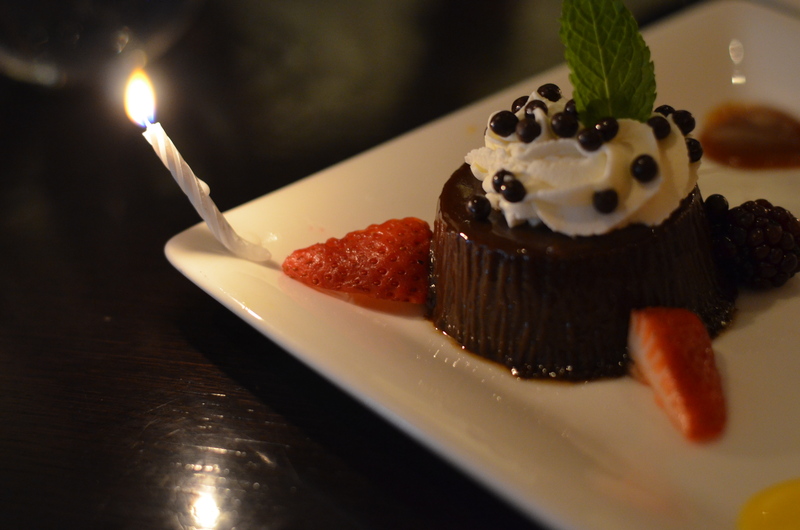 When I blew out the candles I made a wish—one that I won’t share here because that might be bad luck! Hopefully, *when* the wish comes true I’ll be able to share the great news with you all. Here’s to sixteen years and many more.